The label I learned last week was "wastebasket work." As I perused through Cool Cat Teacher's blog, the idea stopped me in my tracks – I had never heard it put that way. It made me reflect on the work my students have been doing. Were we doing all that we could with the technology in our pockets? Honestly, we were doing a few too many worksheets that we never looked at after the debriefs. This is a problem. Although some worksheets have great learning opportunities, learners need more than a series of related tasks that amount to a grade. They need to amount to a product, one not worthy of the wastebasket. Riding this wave of motivation, I began rethinking how we do some of our review activities. 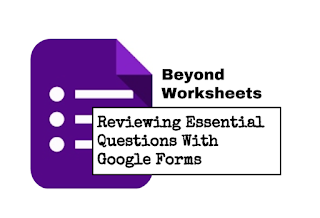 Since my students (BYOD) do well with Google Forms, I decided to change a once paper-based activity to digital. At first, this just seems like doing the same activity, only paperless. 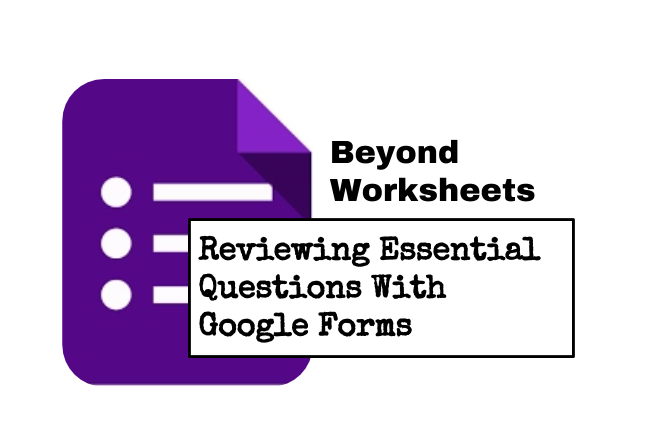 But the shift from sharing essential question responses on paper to submitting responses via Google Form allowed us to do more with the product. Here's what we were able to do beyond the worksheet. The form can be completed several different ways. I like it when students focus on one or two questions and put more effort into their response. The form below was made by assigning questions to students in order to collect three or four responses for each question. After reviewing the responses as a class, students worked together to combine the strengths of all the response into an exemplar for each question. This type of activity combines so many of the critical thinking skills kids need to practice. The work isn't done once the exemplar response is submitted. 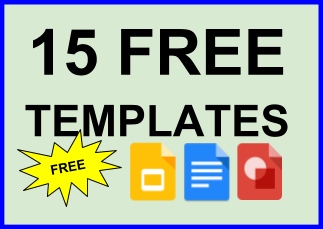 The image below shows a Google Sheet made from the form responses. This format allows the teacher to provide more feedback, and students can add resources to make an interactive study guide. As I mentioned, the sheet allows users to add comments. I also add links to resources and encourage students to do the same. I LOVE how involved the students are in this activity! This is an awesome way to formatively assess, and allow students to interact with the information. Every student fair physcs.But physics is easy subject and also funny. But you can take physics online homework help for overcome your problem.